Senator Bill Bradley served in the U.S. Senate from 1979 to 1997 representing the state of New Jersey. In 2000, he was a candidate for the Democratic nomination for President of the United States. He holds a BA degree in American History from Princeton University and an MA degree from Oxford University where he was a Rhodes Scholar. He has authored seven books on American politics, culture and economy. Prior to serving in the Senate, Senator Bradley was an Olympic gold medalist in 1964 and a professional basketball player with the New York Knicks from 1967 to 1977 during which time they won 2 NBA championships. In 1982 he was elected to the Basketball Hall of Fame. 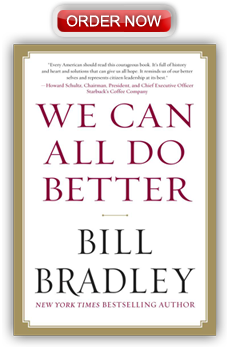 Visit the Facebook page for Bill's radio show, "American Voices"
"Bill Bradley is gone from the NBA and Senate but in this timely book he reminds us that the demands of citizenship never stop -- and he offers a plan to get America back in the game." The social, economic, and fiscal problems the country now faces are severe and challenging in fundamental ways, and all of us must be willing to be part of the solution. The job will be difficult. The present powers-that-be are formidable. Those who would change our country must have vision and courage. There are answers to our problems. They require will, discipline, and sacrifice to bring about, but even that is not sufficient. As citizens, we must have the confidence that our democracy gives us the tools to improve our circumstances. As human beings, we must see our interconnectedness and recognize that we are capable of great things when we cooperate with one another. "Every American should read this courageous book. It's full of history and heart and solutions that can give us all hope. 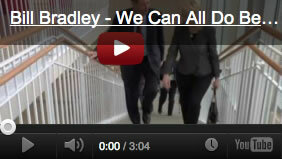 It reminds us of our better selves and represents citizen leadership at its best." "For all of us who care about the renewal of our country and the revitalization of our politics, this extraordinary book provides an indispensable guide. Bradley speaks with unusual clarity, candor, insight and passion about the problems we face and the road we can take to move forward. This book should be widely read."